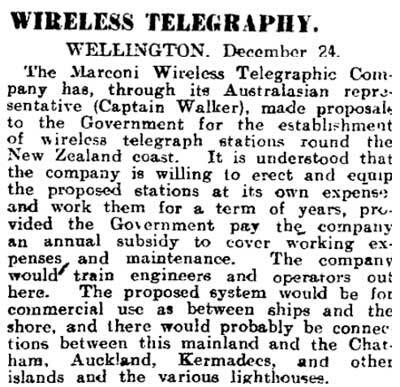 The Marconi Wireless Telegraphic Company has, through its Australasian representative (Captain Walker), made proposals to the Government for the establishment of wireless telegraph stations round the New Zealand coast. It is understood that the company is willing to erect and equip the proposed stations at its own expense and work them for a term of years, provided the Government pays the company an annual subsidy to cover working expenses and maintenance. The company would train engineers and operators out here. The proposed system would be for commercial use as between ships and the shore, and there would probably be connections between this mainland and the Chatham, Auckland, Kermadecs, and other islands and the various lighthouses.